You've installed Restrict Content Pro - now what? This guide will walk you through everything you need to get the plugin setup and ready to go! First you want to enter your license key to enable automatic updates. This will alert you when we release updates to Restrict Content Pro and allow you to download them from inside your admin panel. Restrict Content Pro settings are located in Restrict > Settings. Verify that you're happy with the various page settings ("Registration Page", "Success Page", "Account Page", etc.). Decide whether or not to enable auto renewals. » Learn more about the different auto renewal options. Configure your content restriction message. This is shown to users who try to view a post/page they do not have access to. Fill out the "Subject" and "Email Body" for each notification email that you'd like to send out to members. Decide if you want to receive admin notifications or not ("Disable New User Notifications" checkbox at the bottom of the page). Fill out all fields to set your logo, company name, address, etc. » Learn more about the RCP settings panel. 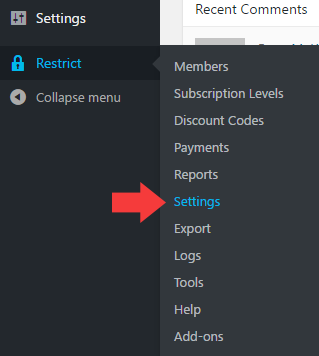 You can choose your desired payment gateway(s) in Restrict > Settings in the Payments tab. Use the checkboxes to enable your chosen gateway(s). Then you also need to scroll down and enter your API information for the gateway(s) you've selected. Each gateway comes with both "test" and "live" credentials. It's important that you enter both in order to fully test your payments. » Read further instructions for setting up each payment gateway. Membership levels are how you group members together to grant them access to restricted content. These are configured in Restrict > Membership Levels. Some sites may only need a single membership level, while others may have numerous. It's totally up to you! Each level can have its own price, duration, access level, and role. How many you need depends on your business model and offerings. » How to create membership levels. Restrict posts, pages, or custom post types individually. Restrict content by category or other taxonomy. Restrict a portion of post or page content with a shortcode. Restrict content in template files with PHP code. Once you have your site setup, it's always a good idea to run a few tests in sandbox mode. This allows you to register with a test account, submit a test payment, and ensure that everything on your site is running as expected. Navigate to Restrict > Settings > Payments and locate the option for Sandbox Mode. Check this on to enable it and save your settings. While you're here, double check to make sure that you've filled out the test credentials for your chosen gateway(s). Next, logout and visit your registration page. Fill out the form to register a new user. While in sandbox mode, you'll want to use test payment details. Stripe - Test credit card details. PayPal - Setting up a sandbox account for test payments. 2Checkout - Test credit card details. If your payment is successful, you should be logged in to your new account, redirected to your chosen welcome page, and granted access to restricted content. When you're done testing, remember to uncheck sandbox mode in Restrict > Settings > Payments! This will allow you to start taking real payments.